Two hours of good music, with plenty of wise cracks, fun and joshing in-between, is the formulae for this charming and cheerful show. 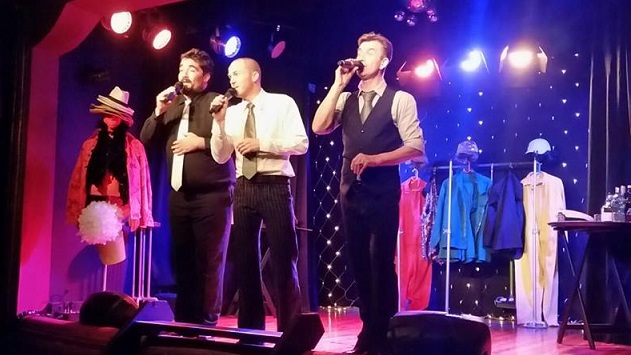 Doffing their hats to the entertainment capital of the world, Las Vegas, Bryan Hiles, Darren King and Rowan Bartlett present Get Knotted, the third in their series of shows which celebrate the many great acts which have appeared on the stages of this iconic city. Fresh from their appearance at the Hilton Arts Festival (see Caroline Smart’s review on the artSMart Webpage) the expanded version of this cabaret styled show is currently enjoying a run at the newly-renovated Rhumbelow Theatre in Durban. Hiles, King and Bartlett are consummate and versatile performers. Stalwarts of the Durban stage, they bring all their skill and experience to bear in this show which is all about good music and good fun. And the artists obviously derive as much fun from the show as do their audience. Included in the show is the music of many of the world’s most popular acts over the years. Included are the likes of The Rat Pack, Dolly Parton and Kenny Rodgers, Harry Connick Jnr, Michael Bublé, Elvis, Simon & Garfunkel, Nat King Cole, Neil Diamond and Barbara Streisand. And that is just a sample of the rather eclectic and wonderful selection included in the show. The only artist you will not hear is Celine Dion. Apparently not a favourite of the trio. For me they could include Streisand to that sentiment. Hiles, King and Bartlett all display excellent singing voices. They all perform solos, but most of the music is presented as duos and trios where they produce very pleasant harmonies. Other than perennial favourites such as New York, New York, Sweet Caroline and Somewhere Over The Rainbow the boys produce truly moving and memorable performances of Elvis’ American Trilogy and Leonard Cohen’s Hallelujah. The later was sung acappella and was the only song in the show that did not have a backtrack. And here my little moan. I would have loved to hear some of the songs with live music. A live piano or guitar would bring an entirely new dimension to the show. Get Knotted is pure unassuming entertainment which offers a fun and very enjoyable night out. I highly recommend it to all. Get Knotted will be at the Rhumbelow Theatre in Umbilo, for a run until September 30, 2018, with Friday and Saturday performances at 20h00 and Sunday shows starting at 14h00. The venue opens 90 minutes before show for picnic dinner. Tickets R150 (R130 pensioners and tables of eight or more). Take along food picnic baskets but burgers, chips and cake will be available. Braais are also available. There is limited secure parking and booking is essential. There is a cash bar (no alcohol may be brought on to the premises). Rhumbelow Durban is situated at 42 Cunningham Road off Bartle Road in Umbilo.